The Warner Archive Collection continues to impress with the breadth and depth of movies they release using their made-to-order (MOD) model. It's also fascinating the way they market these DVDs—tying them to holidays, anniversaries, and the like—with relative ease because of their decision to keep increasing their library (as of this writing, 818 titles and counting) at the rapid rate of 5 - 10 releases A WEEK. February is Black History Month, and the collection released a few titles to celebrate its significance. Most noteworthy is 1969's The Learning Tree, the first studio film by a black director, renaissance man Gordon Parks (Shaft). The semi-autobiographical work, based on his own book, follows two young men in rural Kansas during the early part of the 20th century. Kyle Johnson (son of Star Trek's Nichelle Nichols) plays Newt Winger, the good-hearted protagonist who often has to find the less thornier of two paths out of a moral quagmire. Alex Clarke plays Marcus Savage, the troubled Cain to Newt's Abel. The movie is earnest to a point just short of being cloying. But ultimately, it engages quite effectively because much of its depiction of the hardships faced by Jim Crow-era African Americans rings true. The fluffy romantic comedy, Sunday in New York (1963), was released earlier this month in advance of Valentine's Day. Overscored by pianist Peter Nero, the movie often seems like a vehicle simply to showcase the musician's talent. The movie's exploration of society's sexual mores is quaint as to appear passe even at the time of the picture's release. 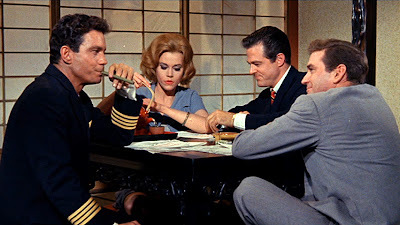 But the fresh appeal of a frighteningly young Jane Fonda and her charming co-stars—a befuddled Rod Taylor, clueless Robert Culp, and best of all, a devilish Cliff Robertson—make this a breezy confection worth enjoying on, apropos of the title, a Sunday afternoon. Nice capsule report there on THE LEARNING TREE which arrived days ago, (I quite agree with your estimation) and of reference to SUNDAY, which I have but I haven't gotten to yet. With Criterion, Warner Archives, and Masters of Cinema and now even Universal and MGM Archives to contend with, my children's college education is in serious jeopardy. I just yesterday ordered "The Whisperers" from the MGM Archives, as Dame Edith Evans gives one of the cinema's most magnificent performances in the lead, one that deserved the Oscar in it's release year. And also offered there is Lumet's THE GROUP and the enduring classic THE BEST MAN. This cost me $79.00 with sales tax and shipping, even though buying the set gave you an automatic 40% off. On Tuesday they are promising some very interesting Joel McCrae releases. It is getting to be where the biggets thrill for me on Tuesdays is the new announcement from WB. I head over there waiting to see what new venture will drain my wallet again! And the archive continues to grow week-by-week as you well know Tony, and just today another interesting batch of westerns and noirs are offered! While there isn't a single "essential" title amongst them, several are most tempting. "Who Are you Wearing Tonight?" Need to Catch Up on 2011's Oscar Nominees?